hen I reached the finals for a Fulbright Fellowship a few years ago, my chosen assignment was at a university outside of Århus, Denmark. I spent a lot of time researching Århus and Copenhagen as well as the food and culture of Denmark. I was sorry to miss out on the Fulbright for a lot of reasons, and the biggest was that I would not get a chance to live in and experience that beautiful country for a semester. The opportunity to visit for a few days before our cruise delighted me. As you probably know by now, though, what I got to see of Copenhagen included mostly the inside of cabs, a hotel, and hospitals. 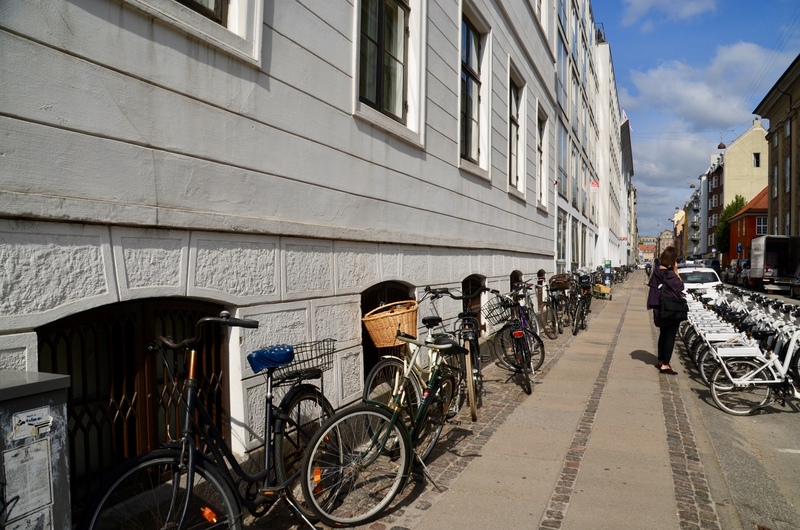 Luckily, though, I was able to walk to Nyhaven (a waterfront and canal area in downtown Copenhagen…photo at top of blog) and spend some time in Den Gamle By (the old town area of Århus). While I didn’t experience Denmark in the way I would have liked, I did learn a few interesting items that have nothing to do with healthcare. If you think Amsterdam is the only city in which cycling is king, think again. Copenhagen overtook Amsterdam as the Number One Cycling City a few years ago, although Amsterdam still gives it a run for its money. Nonetheless, cycling in Copenhagen in particular and Denmark in general is a major mode of transportation. There are more bikes in Denmark (4.2 million) than cars (1.8 million), and many middle-class families don’t even own cars. More than 50% of Copenhageners ride a bike to work daily—even in rain and snow, and 63% of the members of Parliament commute by bike. 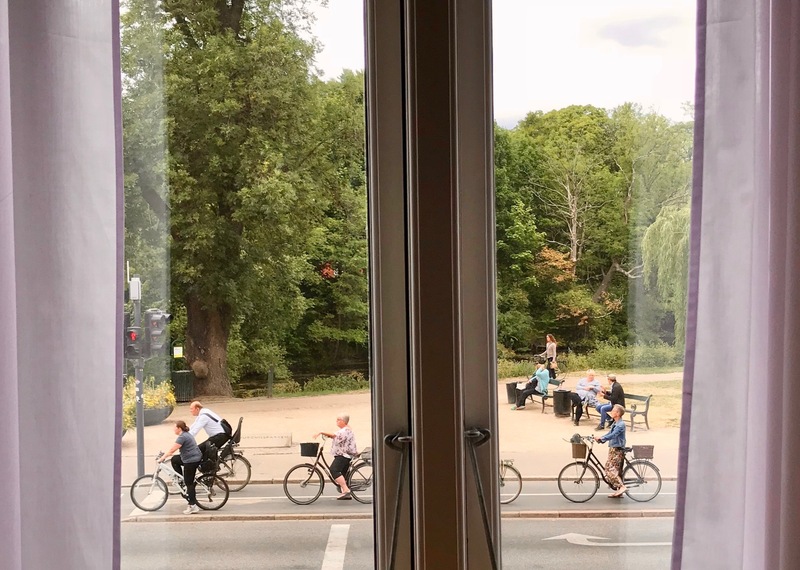 There are almost 400 kilometers of bike lanes in Copenhagen (12,000+ in Denmark), and residents cycle 1.13 million kilometers daily. The bike lanes, by the way, have curbs that separate them from the sidewalk on one side and the street on the other. Denmark is rather flat, but as of later this year, Copenhageners will be able to ski a few miles from downtown when the city’s newest power plant opens. Located three miles from the city center, the plant features a ski slope of almost 2000 feet with an 86-meter vertical drop from the top to the ground. The ski slopes will feature runs for four levels of skiers from easy to black diamond, and instead of gondolas, skiers will take elevators inside the building to the top of the runs. For Copenhageners who love the outdoors but are not wild about skiing, the power plant will also have the world’s largest climbing wall and a recreation area (soccer fields, go-kart track, hiking paths) surrounding the building. By the way, instead of spewing large clouds of smoke from its stacks, the power plant will blow smoke rings. Den Gamle By (DGB) is Århus’s historical open-air museum, a collection of buildings, tools, businesses, activities, and costumed characters that tell the story of Århus of old. DGB concentrates on three periods of the town’s history—the 1800s, 1920s, and 1970s. The buildings, walkways, people, and businesses change as you progress from one era to the other. There are more than 75 buildings (many half-timber) saved from a number of different parts of the country, and they date from the mid-16th century to the late 19th century. Included within the open-air museum are several other museums including those that feature toys, clocks, textiles, and more. Let me get right to the point: That delightful morning pastry we call a “Danish” is not so Danish after all. In Denmark, they don’t even call it that; instead, the Danes call it wienerbrød, or Vienna bread, paying homage to the place where it originated. Wienerbrød is a multilayered, croissant-like pastry that is filled with a buttercream mixture. While many are topped with almonds or sugar, others are plain. They are a perfect breakfast or snack food. As fate would have it, I didn’t get a chance to try wienerbrød while we were in Denmark. Actually, I didn’t get a chance to try any Danish food since I had little appetite after my hospital visit. I guess that means I’ll just have to go back.